Hi! I am Cheryl Chong from the M2 batch this year! I want to join MedSoc because I feel that it is something which is very important in the lives of all medical students, although many do not notice. I am a person who is extremely committed and dedicated to what I believe in, and this is one of them! I assure you that I will definitely put in my 100% into this role, I hope that you will give me your support and grant me the opportunity to serve you. 1. Increase participation and involvement in the publications – getting more people on board the team to help design, write and publicize (mainly Auricle – the publication for the med students, by the med students)! As well as increase participation in our annual Writing Month! 2. Building interest in literature – providing more exposure to literature through outreach initiatives and events. Showcase and recognise works of the medical students on various platforms. 3. Fostering talent in writers and designers – providing more space to explore and be creative, improving skills through networking and collaborating with fellow enthusiasts. Providing workshop opportunities to learn and better their skills. I hope you can give me your vote of confidence! To create a vibrant culture of literary appreciation and expression in med school! Hello! 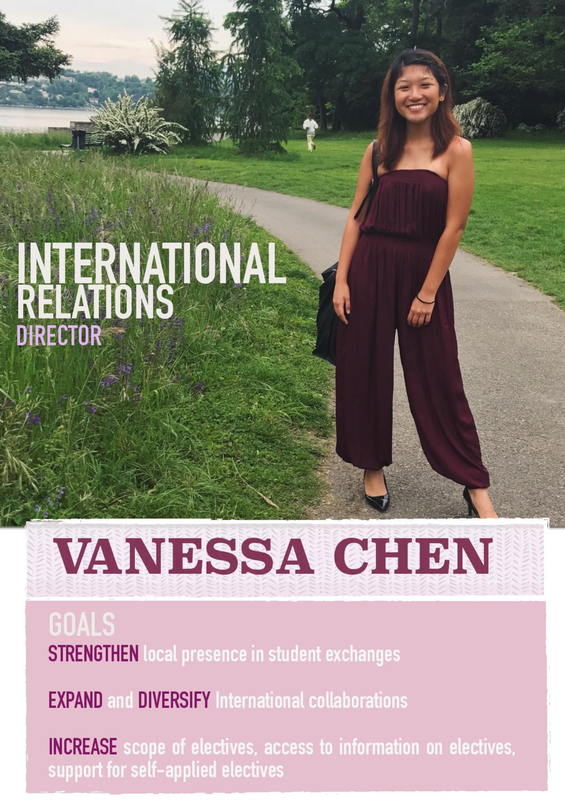 I am Vanessa, and I am running for the position of International Relations Director. As someone who has actively participated in international exchanges and conferences such as the 70th World Health Assembly, advocating for change at the global arena, I have gained a global perspective and experience in building international connections. I hope to use my experience and skills to create more opportunities for YOU to have greater international exposure. This means greater access to more exciting and diverse bilateral exchanges and enjoying greater opportunities to explore what YOU want to do for electives. I hope you will place your trust in me to champion for your interests. I will be explaining some of my plans in detail in the subsequent emails. Stay tuned! 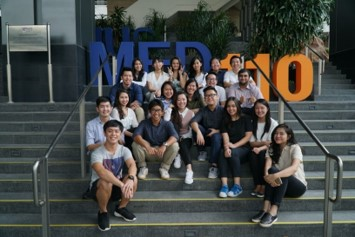 This photo shows a group of Indonesian medical students with some of us NUS kids (spot Christelle making the cute pose!) when they visited us from Jakarta in Jan 2017. As International Relations Director, I understand how important it is to build good relations with external parties (local and overseas) and put our best foot forward. This will boost our reputation in the medical fraternity, both locally and internationally, as well as provide our students with more opportunities for project collaboration. As VP, I hope to help spearhead the effort to improve our school’s representation to all partners, so that our students may reap the benefits of these relations professionally, personally and otherwise. Research Directorate serves to promote research, innovation & enterprise among medical students. 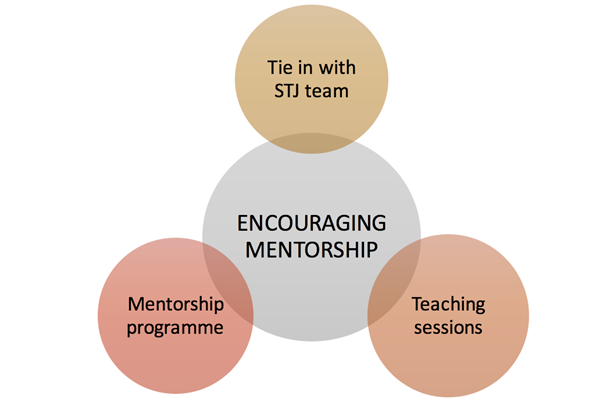 Our mentorship and teaching programmes are currently only available to the M1s. This year, we would like to try to expand them to include the M2 batch. Additionally, if the opportunity arises, we would like to invite passionate individuals who are not members of the directorate to join us as mentors in these programmes. For students in the clinical years, we will continue to work closely with our seniors to identify additional areas that can be supported. We also intend to increase our collaborative efforts with the “cases and problems” team. Our aim is to identify gaps in the peer-to-peer and near-pear teaching schemes that are currently available, and to offer new programmes which may fill these gaps. As always, if you have any questions or suggestions, please feel free to reach out to me! Thank you!!! I am Michelle, and I am running for Career Directorate. Today, I am going to briefly introduce my plans for Career Directorate, as well as why you should vote for me. Do look out for my future election newsfeed posts for a more detailed plan! This term, my main focus would be on these three core functions. The reason why I believe these three functions are very important is based on the previous Medsoc Grand Survey, where there was feedback from different years on what they wanted, and hence I believe a tailored plan is necessary to reach out to each year based on their needs. And finally, as the Welfare Director of the 68th Medical Society, I am well-versed with the ins and outs of Medsoc and will be able to better work and collaborate with my fellow exco members in order to bring about more initiatives and changes for YOU. Hello everyone! 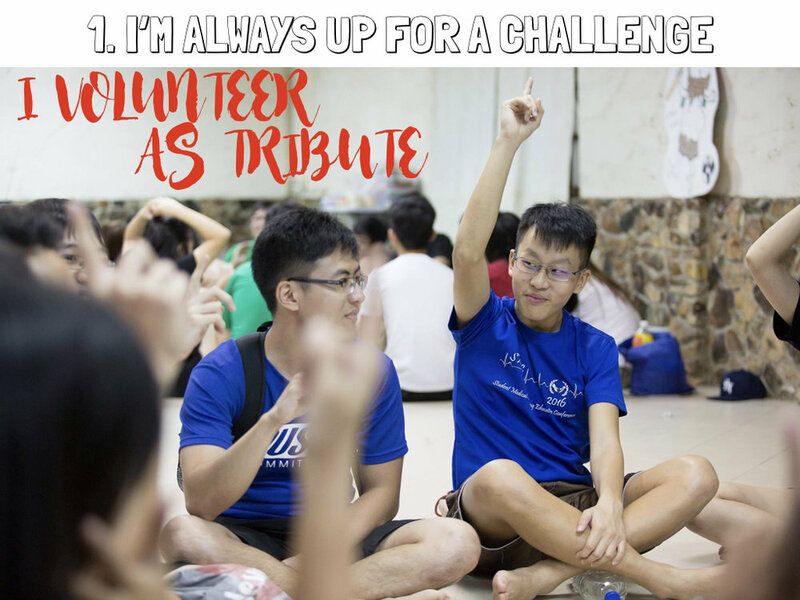 I'm Fan Shuen, running for the role of Honorary Treasurer. My 2nd reason for wanting to run for Honorary Treasurer in the 69th Medical Society EXCO, also happens to be a belief I hold very dear! I cannot be more grateful for everything I have experienced in medical school: a conducive learning environment, a gazillion opportunities to give back to society, a wonderful senior-junior teaching culture, and most importantly..... so many great friends, seniors and professors!! This would not have been possible without ALL the great initiatives rolled out by the NUS Medical Society over decades and decades!! Thinking back to M1 life, I'm truly amazed at how much the society was able to contribute in the areas of student advocacy + holistic development. PLEASE GIVE ME THE CHANCE TO SERVE YOU. VOTE FAN SHUEN FOR HONORARY TREASURER. Hello! 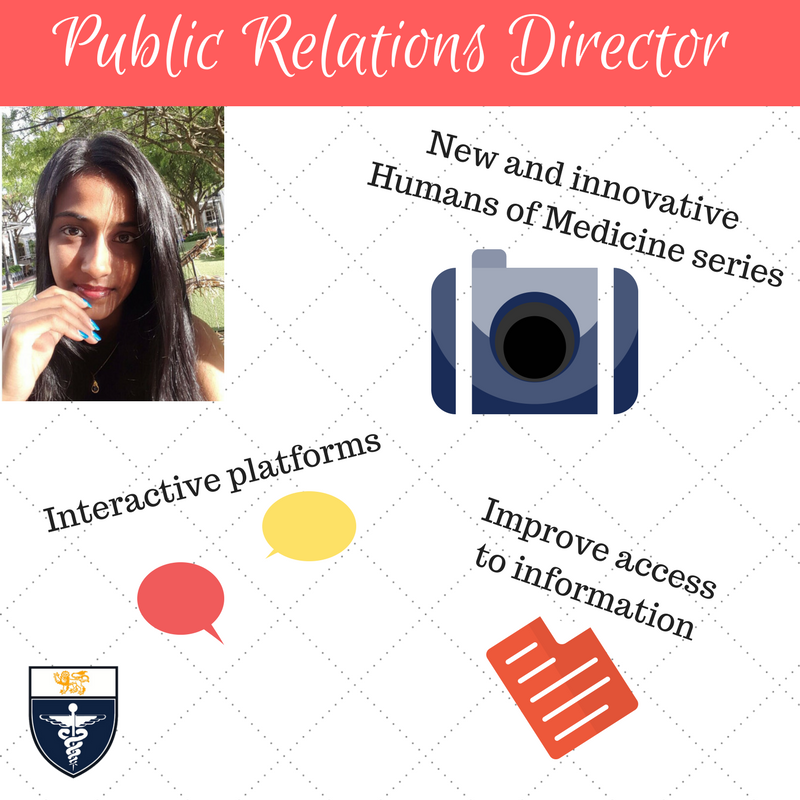 I’m Hema from House 3 and I’m running for Public Relations Director! With ample experience working with the Dean’s Office and in Medsoc, I decided to run because I feel that I will be able to make a change for the better and push the boundaries of what MedSoc can do for YOU! ‘Never Give Up’ as cliché as it sounds, it has been my motto for years. I am a passionate person who dives head first into hardwork, determined to prove myself. As public relations director, I have 4 main aims which I will explain over the next few election newsfeeds. I’ve provided a sneak peak with the poster above. Do keep a lookout for them! Feel free to check out my manifesto and ask me questions in the links provided above! At the end of the day, you will be deciding the next generation of leaders to continue serving you. So, if you feel like I would be suitable, please vote for me! 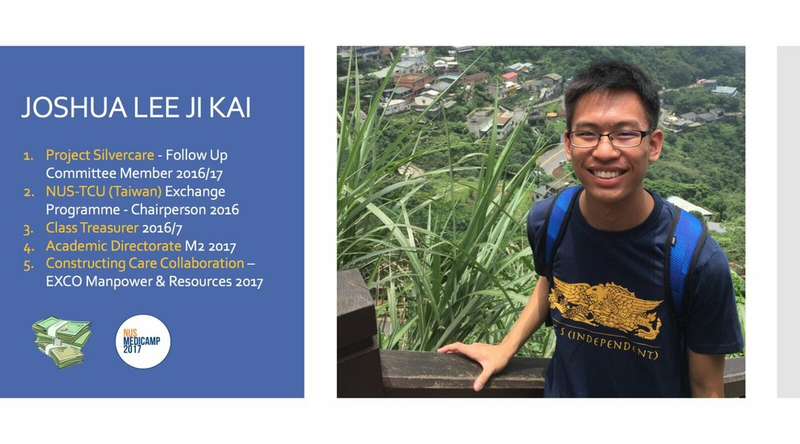 Hi everyone, I am Dylen Mun an M4, and I’m running for the position of International Relations Director. 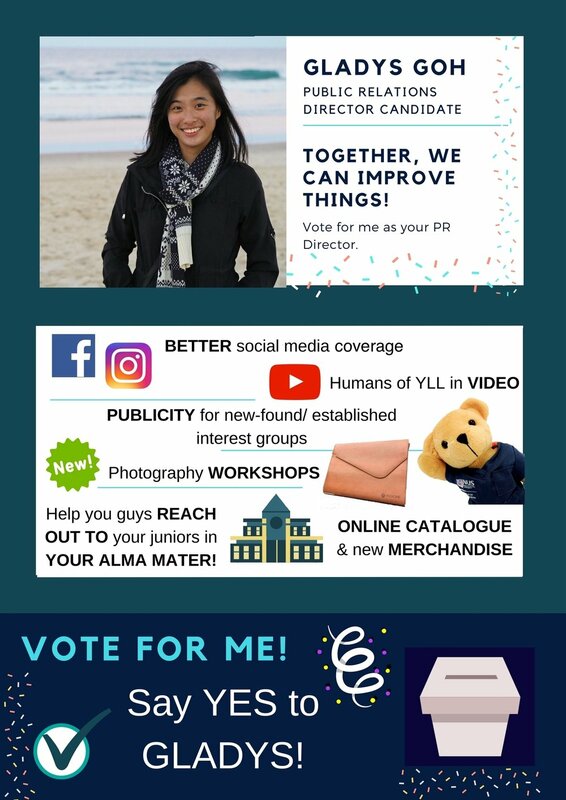 Vote for Dylen Mun for an international experience for everyone! Hi everyone! I’m Gladys and I’m running for the position of Public Relations Director! Here, I’ll be sharing the plans I’ve laid out for the PR Directorate! 1. Establish ourselves on YOUTUBE with Humans of YLLSoM revamped in VIDEO form for better engagement, forging better connection with students online & greater media attention on valuable content. 2. Support students’ development through photography workshops, for different skill levels – basic to intermediate and use these skills in events coverage! 3. Widen our outreach to YOUR alma mater with Medicine talks given to your BELOVED juniors. I’ll help YOU find out more about entry system and syllabus changes! 4. Help YOU get greater publicity for NEW interest groups! 5. Develop NUS Medicine brand with an E-catalogue containing our own merchandise. With the loyalty programme rolled out, the MORE POINTS you earn, the MORE DISCOUNTS you get! 6. Increase accessibility and convenience for sharing YOUR ideas and opinions with a Suggestion Box placed in each houseroom! These feedbacks will be raised to MedSoc and Dean’s Office during each Presidential Commission session! – YOUR VOICE WILL BE HEARD. If YOU want these changes implemented, do lend me your support! 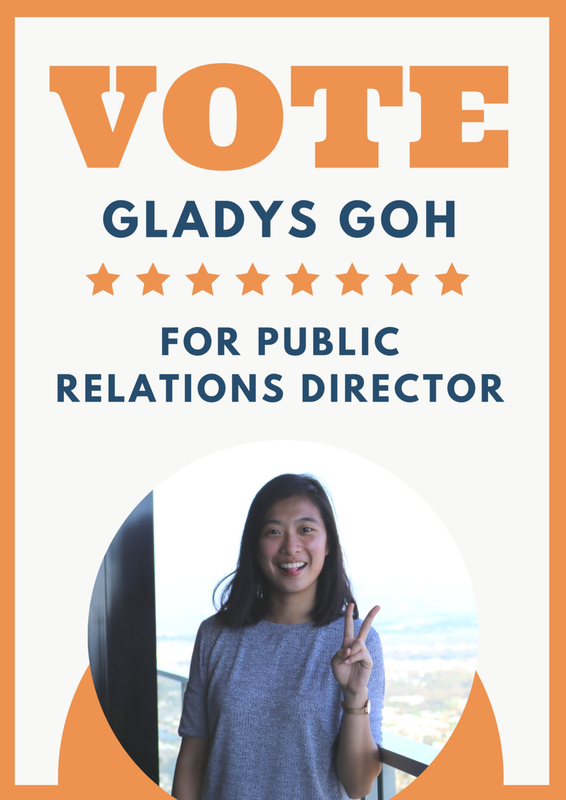 Vote “YES” for Gladys for Public Relations Director! Hello friends! :) In my last message, I asked all of us to take some time to consider what kind of MedSoc we want to build together. Today, I will be sharing with you my vision for the 69th Medical Society and how that will translate into tangible outcomes for the student population. 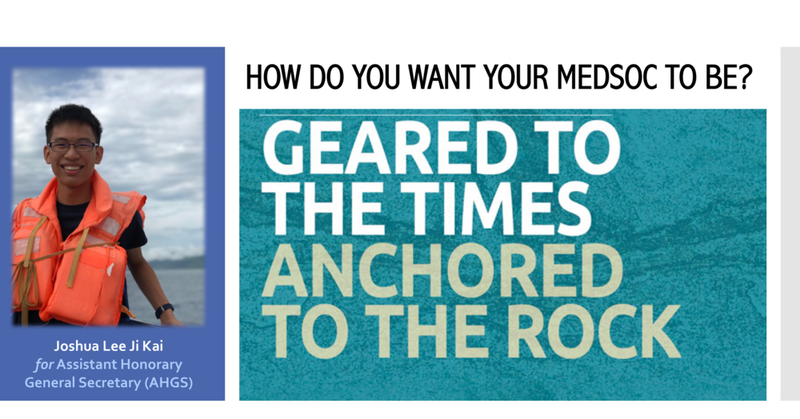 In short, my vision is for the Medical Society to be “Geared to the Times, Anchored to the Rock”. 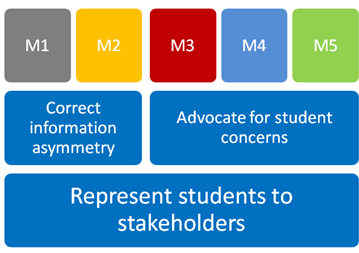 What this means is having a MedSoc that continues to actively put students first - as the bedrock of every initiative. This involves the provision of strong support platforms for student-led initiatives and a timely responsiveness to feedback from the ground, all whilst upholding the legacy, ideals and ethics of the healthcare profession. At the same time, the Medical Society needs to innovate and keep up with developments both within the school and in the healthcare setting, to ensure that we remain relevant as a student society. There are two ways in which I hope to realise this dream, which I will share with you over my next few messages. Stay tuned!! 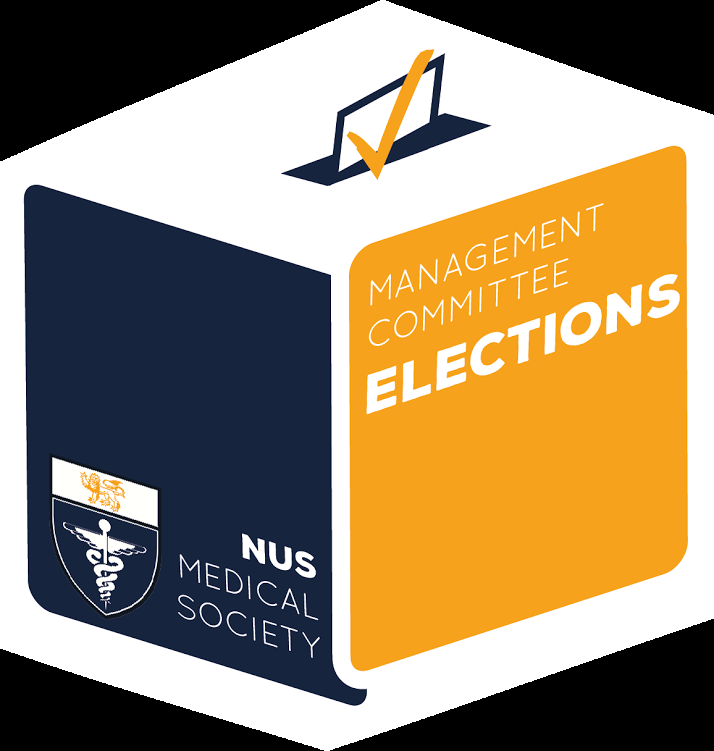 The time to elect our next generation of leaders for the 69th Medical Society is coming soon! Every vote counts so make sure you make an informed choice when voting for our next batch of directors! Perhaps you are curious about who exactly will take up these roles as Medsoc directors and EXCO members. This electionnewsfeed aims to give a short introduction of the people running for the various positions, and make their voices heard about why they should become the next director. Be sure to keep a lookout for their speeches after lectures as well! Also, click here to view all the participants' application forms for the 69th Medsoc EXCO and find out more about their goals and ambitions! Hello everyone! My name is Joshua and I will be running for the position of Assistant Honorary General Secretary! Let me start by introducing myself - I am M2 this year, and graduated from ACS (Independent) in 2015! Some of you may also recognise me as the M2 Class Treasurer or Project Silvercare committee member! Last year, I pioneered a new exchange programme to Tzu Chi University in Taiwan for M1s, working closely with Prof Ng Yee Kong and MedSoc International Relations. This valuable opportunity exposed me to the roots of our Silent Mentor programme and what it means to be a good doctor. Over the coming days, you will be hearing more about each of our goals, ideas and motivations for the 69th Medical Society. As a responsible citizenry, it is timely for all of us to consider - what kind of MedSoc do we want to build together? I encourage all of you to examine my ideas critically with an open mind, ask questions, and vote for the individual who best appeals to your vision for MedSoc. These are all current programmes of the directorate, and we will continue to ensure that they are made available to the student population. However, our focus for this year is to move towards a more needs-based model. Are our briefings given at the wrong time, do they not address the questions you may have? Is our helpline response time too slow, or are the quality of the answers not up to your expectations? 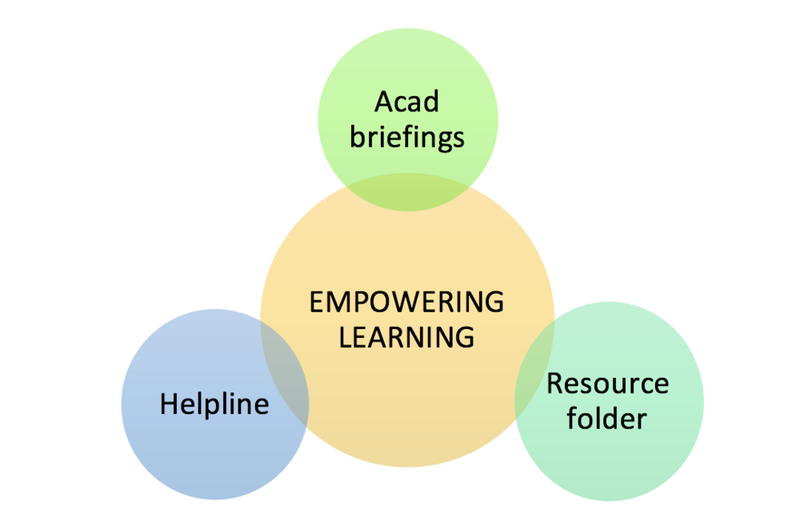 And would you like to have a greater variety of resources to study from? We want to hear what you have to say- because at the heart of it all, we want our programmes to go towards fulfilling your educational needs! If you have any questions or suggestions, my team and I would love to hear from you! Do feel free to drop me a message at shawnwong.101@gmail.com. Hello friends! I’m Gladys (M2), running for Public Relations Director! Establishing ourselves on YOUTUBE: Remember scrolling through Instagram, Facebook and seeing long paragraphs for Humans of YLLSoM [Alumni Edition]? Feeling too tired to read the long posts? I plan to revamp it into a video instead! One that ENGAGES YOU and aids easier understanding! Photography Workshops: Have a chance to polish YOUR photography skills and put them to good use in events coverage! Outreach to YOUR alma mater: Giving talks to your juniors about medical school? Fret not! I’ll help YOU find out more about entry system and syllabus changes PLUS provide up-to-date handouts to BENEFIT YOUR BELOVED JUNIORS! Online Catalogue and Merchandise: Featuring NUS Medicine’s very own products and earn loyalty points! The MORE POINTS you earn, the MORE DISCOUNTS you get! Drop-in Feedback: Sharing of YOUR ideas and opinions is made easier with a Suggestion Box placed in each houseroom! These feedbacks are then raised to MedSoc and Dean’s Office during the Presidential Commission sessions! – YOUR VOICE WILL BE HEARD. All these will not be possible without YOU! Vote “YES” for Gladys for Public Relations Director!! In the next few Elections Newsfeeds, I will tell you 5 reasons why I hope to be Honorary Treasurer in the 69th Medical Society EXCO! Managing the Treasury is not easy work -- make no mistake about it. Vetting, submitting and filing a gazillion claims, filling and checking quotations, settling bulk payments, signing cheques, filing for audits etc. The work never ends!! BUT, I'm always ready for a challenge. No matter how arduous, tedious, or frustrating, I always give my very best for the benefit of the student population and the society. THAT IS MY ELECTION PROMISE TO YOU. 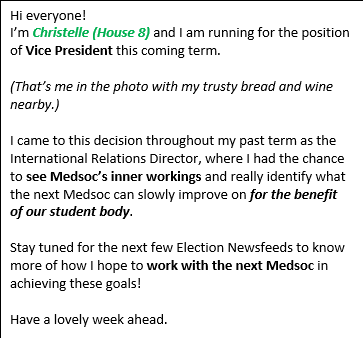 I’m Christelle (House 8) and I am running for the position of Vice President this coming term. I came to this decision throughout my past term as the International Relations Director, where I had the chance to see Medsoc’s inner workings and really identify what the next Medsoc can slowly improve on for the benefit of our student body. Stay tuned for the next few Election Newsfeeds to know more of how I hope to work with the next Medsoc in achieving these goals!